The IL-28Sh is a Rank V Russian jet bomber with a battle rating of 8.0 (AB/RB/SB). 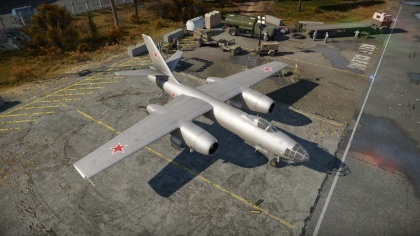 This aircraft was introduced in Update 1.79 "Project X". 850 400 600 ~?? ~? < 500 < 600 < 600 > ??? Development work on the IL-28Sh (Sh = Shturmovik; attacker) began in 1967 after it became clear that the main fighter-bomber of the Soviet air force, the MiG-15, had insufficient combat loads. As a result of this, Soviet engineers once more began looking into the possibility of converting some IL-28 bombers into attack aircraft. This resulted in the creation of the IL-28Sh, a regular IL-28 modified to fit 12 external pylons suspended underneath the wings. This allowed the IL-28Sh to carry, in addition to its standard internal payloads, a large number of suspended ordnance options ranging from rocket-and gunpods to additional bombs. Testing of the modified machine began in autumn 1967, showing positive results. 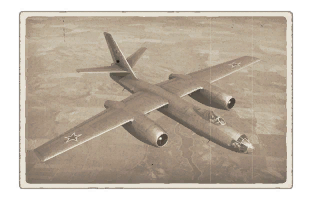 However, the way the Soviet high command envisioned to use the aircraft as an attacker contradicted some of the design choices made initially, while the aircraft was still intended to be used as a bomber. To fully utilize the destructive power of its expanded payload options and to avoid premature detection as well as anti-aircraft fire, the IL-28Sh was intended to be used at low to extremely low altitudes (going as low as 60 m). Operating at extremely low altitude like this meant that the crew of the Il-28Sh had to undergo special training in order to acquire the skills needed to use the machine this way. However, the biggest advantage that this kind of low-level flying offered was excellent visibility for both the pilot and bombardier as well as allowing the aircraft to be operated from front-line airfields. Nonetheless, testing also showed that the IL-28Sh wasn’t without its flaws. Not only did the IL-28Sh lack sufficient enough armor protection to be used in this kind of role, but that the risk of losing the crew in an emergency situation was far greater than usually. These severe drawbacks ultimately led to the IL-28Sh being classified as unsuitable for the role of an attack aircraft and the project was shut down soon afterwards. Despite 70 regular IL-28 units being planned to be converted to the attacker version, only a handful of them was actually modified before the project was shut down.